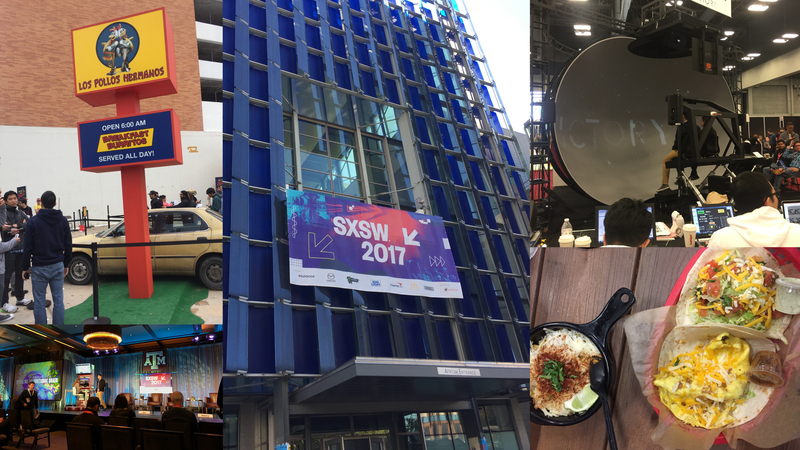 During a whirlwind 68 hours in Austin, TX this past week, information, inspiration and lots of tacos were on the menu at SXSW, one of tech’s premiere conferences. The global celebration of innovation and interactive trends is a melting pot for marketers, entrepreneurs and the generally tech-savvy. And while I experienced just a small slice of the weeklong festivities, I flew home with a notebook filled with new ideas for my team and my clients. Below are my top 10 takeaways, in no particular order. Virtual Reality is Very Real. VR experiences dominated the panel discussions and the tradeshow flow at SXSW this year. It seemed that every. single. booth. was selling a VR solution, or demoing VR hardware or using VR to invite visitors to immerse themselves in a branded experience. Whether you were virtually flying over rooftops around the world, playing a virtual turntable as a virtual DJ or diving into a 360-degree virtual beer tasting, you couldn’t escape the virtual experiences. VR is undeniably the new playground for marketers to provide a branded experience for consumers – but the challenge will be to do it well, with purpose, and in a way that stands apart from the crowd. And that’s still a very high bar. ROAS is the new ROI. Because we don’t have enough acronyms in our lives, social media scientists spoke of “Return on Ad Spend” as the new primary metric. A small but important shift from traditional ROI measurement, ROAS puts marketing at the forefront of the investment, measuring the revenue generated for every dollar spent on advertising (vs. the profit relative to the cost). We all just need to take a minute to breathe. SXSW 2017 had a heavy focus on health and well being, so I attended a panel moderated by Ferny Barcelo, a local therapist, who offered tips and tools to incorporate mindfulness and meditation into everyday life. As a budding meditator, I was inspired to make the practice a part of my routine, taking the time to be present and to be proactive in my own wellness. Research shows that as little as 5 minutes a day can have a profoundly positive impact on stress, anxiety, depression and self-esteem. And who doesn’t want that? Namaste. One of the best panels during my time in Austin was moderated by Michael Hondorp, the retail category lead for Instagram’s Brand Development team. Michael highlighted the new tools that Instagram is offering to advertisers – Stories, Boomerang, Hyperlapse and Layout, to name a few – that enrich the connection between user and brand. He also showcased the new “Tap to View Products” functionality that invites brands to create an immersive shopping experience that mimics the brick-and-mortar approach. It’s more than just selling a product – it’s a fully merchandised store experience, offering inspiration, discovery and storytelling. Tacos are appropriate for every meal. Breakfast. Lunch. Appetizers. Dinner. I did it all, and I don’t regret it. My personal favorite is the fried avocado taco at Mighty Cone food truck. But in Austin, you really can’t wrong with any taco, any time. Predictive modeling is the future of path-to-purchase. Both Diageo and Kohl’s shared case studies on the use of data (big and small) to drive a better experience for consumers in the store and at the bar. While the collection of data is up for debate (see #7 below), savvy marketers recognize that micro and macro trends can enrich a brand’s connection with consumers at retail and increase the basket ring. Retailers are tracking your movement around the store via their Wi-Fi network, to better merchandise the floor. Facebook is monitoring how you react to big events like the Super Bowl and Academy Awards, to understand why you’re using the platform. The University of Pennsylvania analyzed your tweets to better predict your risk of heart disease – and did so more successfully than the CDC. So if you weren’t paranoid before, you should be now. But (for the most part), these prying eyes are using data to enhance our lives, our brand experiences and our social outreach. That said, the collection and analysis of this data is hotly contested; most panelists agreed that consumers should “opt in” to data collection. Though none really spoke to exactly how that process works for their brands. Do good and be happy. That advice from Aristotle was central to a panel presented by Austin entrepreneur and unofficial spokesman Roy Spence, a longtime friend of RT and a co-founder of GSD&M. Roy shared advice on finding purpose in business and in life, with anecdotes from his decades in advertising. His belief that we must ladder up to a higher emotional purpose, that we need to shift from what we do to what we stand for, was a rallying cry for anyone looking to make a difference in their organization and in the world. That’s some good ol’ Texas inspiration, y’all. The gap between Facebook and Instagram is widening. A team from the Marketing Science division of Facebook and Instagram shared a multifaceted research study that identified the differences and similarities in user behavior on and attitudes toward Facebook and Instagram. Not surprisingly, Facebook is the place for “real-time information and opinions” while Instagram users seek “inspiration and exploration.” And while the two sibling platforms now offer more integration than ever, a separate yet complementary strategy that plays to the strength of each can have a significant impact on results – with Instagram delivering upper-funnel metrics like recall and awareness, and Facebook delivering lower-funnel metrics like preference and sales. The one-two punch offers advertisers a larger, more active audience than any other channel available. Walter White would be jealous. The hands-down best activation of the week was courtesy of AMC, promoting its “Breaking Bad” spinoff series “Better Call Saul” (that you should watch, immediately, if you don’t already). Without giving away any spoilers, a fast-food chicken chain called Los Pollos Hermanos is central to both shows – and for three days in Austin, fans were transported to Albuquerque via a real-life brick-and-mortar popup restaurant. Anyone who braved the long line was treated to free curly fries, and stars of each series even signed autographs and took photos behind the counter. It was a fan’s dream come true, and if the hashtag search is any indication, it was SXSW’s most popular exhibit.